The Auditorium is filled with art everywhere you look. The theatre houses lavish mosaics, murals, plaster casts, stencils, art glass, and iron casts. 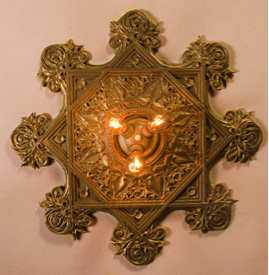 Louis Sullivan’s ornamentation and designs are all inspired by natural forms. Many of these details were designed by Sullivan himself, and other elements were contracted out to the firm of George Healy and Louis Millet or other artists such as Charles Holloway and Albert Francis Fleury. Healy and Millet were contracted to design the art glass and to assist Sullivan in decorating the surfaces of the theatre’s interior. Some of the original drawings for the theatre interior ornamentation are signed by Sullivan’s young draftsman, Frank Lloyd Wright, who became known as America’s most famous architect. Wright was hired by the firm of Adler and Sullivan in 1888. Mosaic marble floors and walls designed by Sullivan flow throughout the theatre. Nature, life, and music were the unifying themes of the Auditorium Theatre’s murals. In the Auditorium Theatre’s opening night program, Sullivan described the theatre murals as expressing growth and decadence as the two great cyclic rhythms of nature. 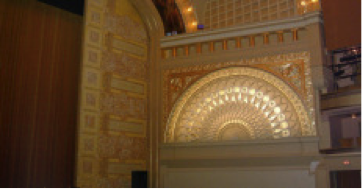 The Auditorium Theater’s central mural, located above the proscenium arch, was designed by a young American artist named Charles Holloway. Holloway was selected for this honor by winning a competition administered by Healy and Millet. Hundreds of artists entered the competition, including Louis C. Tiffany of New York City (and later Tiffany & Co.). Holloway was 29 years old at the time. At the apex of the muralare the words: “The utterance of life is a song, the symphony of nature.” Holloway’s design represents humanity at different stages of life through song: the past, or the “Song of Sorrow,” to the present, the “Song of Joy,” and to the future, the “Song of Hope.” This mural is meant to be viewed from right to left (south to north). Among the 40 life-size classical figures are (starting at the far right) anangel before a bright fire symbolizing birth and inspiration, groups of joyful dancers, a male receiving a garland from a woman, a mother with a baby at her breast, a young child riding on a tiger’s back, and youthful lovers. At the center of the proscenium’s mural are three figures representing the present, the past,and the future. The left side of the arch depicts images of sorrow and death: a philosopher with one hand on a skull, a grieving woman, a young man holding a dying companion, a daughter at the feet of her aging mother, a cross, a group of monks, the angel of twilight. The two large side murals, designed and painted by French-trained artist Albert Francis Fleury (1848-1924), continue the theme of nature found over the proscenium. The south mural depicts spring and contains a character facing the audience. The words “O, soft, melodious spring time! First-born of life and love” are inscribed at the painting’s base. The north mural shows a cool autumn day, a character walking away from the audience, and an inscription that reads, “A great life has passed into the tomb and there awaits the requiem of winter’s snows.” Both quotes are from a poem written by Louis Sullivan titled “Inspiration.” The side murals were designed to be illuminated by the overhead art glass skylight. Much of the theatre is detailed meticulously with stencil ornament designed by Sullivan or Healy and Millet and painted with gold leaf. 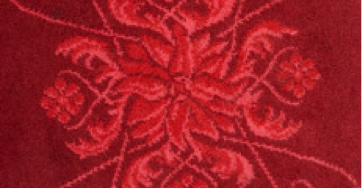 Sullivan designed ornamental maroon wool carpets to cover the theatre’s upper lobbies. Marshall Field and Company supplied the woven carpets made to Sullivan’s specifications for the Auditorium Theatre. The curvilinear foliate motifs, intertwined vines, and leaves in carpets can also be seen in stencil designs, in the shapes of wrought iron on the stair railings, and on the plaster relief on the stairways. Four portrait medallions appear in gold leaf on either side of the stage between the proscenium opening and the first set of boxes. The medallions were designed by Johannes Gelert, a Danish-born New York sculptor, who was chosen by Healy and Millet to work on the Auditorium. The portraits are of Wagner (opera), Haydn (orchestral music), Shakespeare (drama), and Demosthenes (oratory). 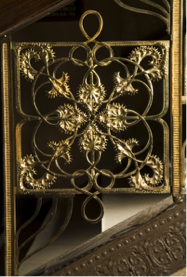 Bronze-plated cast iron panels decorate the stairways leading from the main lobby to the first balcony. The panels feature intertwined tendrils and leaves that also appear in the pattern of the carpet, plaster relief, carved wood, and stencils. Beginning at the balcony level, railings are decorated with wrought iron spirals that echo the stencils on the stairway landings. 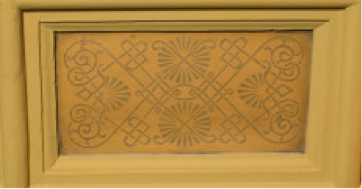 Sullivan created relief plaster designs that can be seen throughout the Auditorium. His hand-drawn designs were developed into three-dimensional forms by modelers hired by Healy and Millet to work on the Auditorium. Areas of the lobby and dress circle are decorated with unique plaster relief surrounding each light, while other areas of the theatre highlight repetition of the same design. Decorative plasterwork was considered superior to other mediums in terms of fireproofing. The Auditorium Building’s art glass was designed and created by the firm of George Healy and Louis Millet. Six arched art glass lunettes are located above the doors leading from the box office entryway into the main lobby. An early source describes the inspiration of the lunettes as the allegorical figures of Wisdom, Oratory, Drama, Music, Poetry, and Dance, representing the forms of art that the theatre’s founders hoped would be performed on its stage. The Auditorium Theatre’s skylights were located above the balcony, just west of the main arches. These skylights illuminated the balcony and murals below with natural light and enhanced the design of the interior of the theatre. Healy and Millet’s design features a foliate and tendril motif in brown, russet, ocher, and yellow. The skylights could be closed during matinee performances that depended on stage lighting and effects.